There used to be only 2 versions of the INFINITI QX80, one in RWD and one in 4WD that are now respectively called the LUXE & LUXE 4WD. 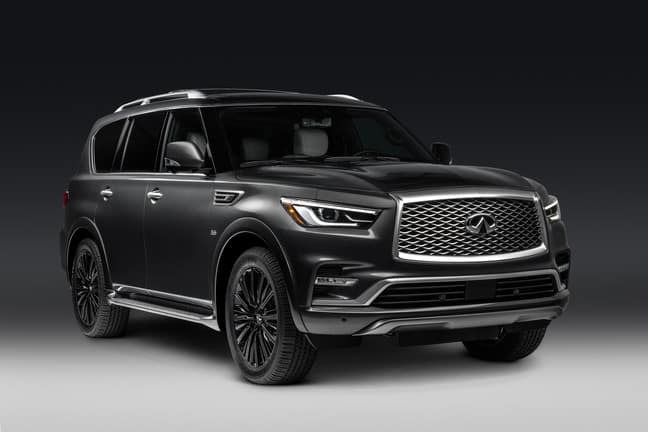 Now, there’s a third model that’s all-new: the 2019 INFINITI QX80 LIMITED. The QX80 LIMITED is designed for giving you an even more powerful & upscale luxury SUV that ever before. Under the hood of every 2019 INFINITI QX80 at our Bergen County NJ dealership location is the same 400-horsepower 5.6L V8 engine with a 7-speed automatic transmission as that’s been powering this vehicle reliably for years. Also enhancing the performance of the LIMITED trim is INFINITI All-mode 4WD and the Hydraulic Body Motion Control system. These 2 technologies help give you added driving confidence through optimal control during all weather conditions that North New Jersey winters bring. 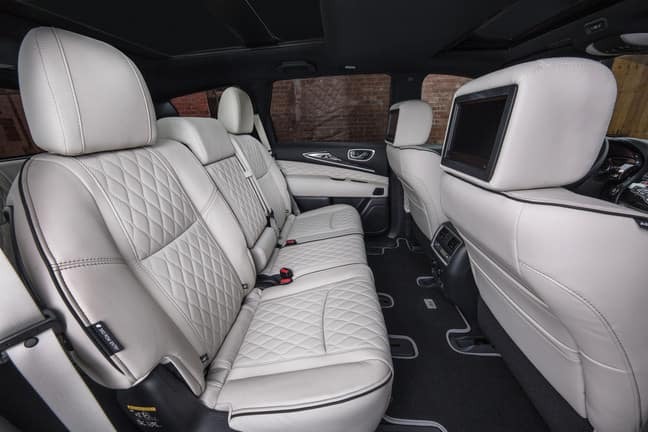 The QX80 LIMITED gives you room for up to 7 passengers who can sit in this model’s uniquely designed 2-tone semi-aniline leather/Alcantara-appointed seats with quilting, contrast piping & stitching. The seats themselves are captain’s chairs in the front and second rows, along with a 3-passenger bench in the third row. If you’re looking for loads of convenience in your next SUV, the 2019 INFINITI QX80 LIMITED gives you just that. For starters, the INFINITI Smart Rear View Mirror comes equipped and this feature enables for you to use that mirror as either a conventional mirror or a rear monitor that lets you see what’s behind you even when the back window is blocked. There are many other things you can get in this SUV such as noise isolation, multiple USB ports, wireless audio streaming and the Theater Package with headrest screens for individual watching. Contact the team at Ramsey INFINITI to learn more about the 2019 INFINITI QX80 LIMITED that’ll be here at our dealership serving Clifton & Englewood NJ!